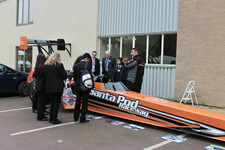 Santa Pod Raceway offers exciting and unique educational visits for schools, colleges and after school groups. We will bring one of our full size drag vehicles along to your educational venue accompanied by members of Santa Pod staff who will talk about the mechanics of the dragster and explain the different components of the car. We are very adaptable and will meet your specific requirements but usually a Powerpoint introduction followed by outside group sessions with the dragster works very well. At the end of the session, a Q&A session will be available. To accommodate our drag vehicle, there must be access for a 7.5 tonne lorry either to a playground, car park or recreational area with a 10 x 6m area available. Although our visit is suitable for all ages, we find that KS2 and above benefit the most from our visits. 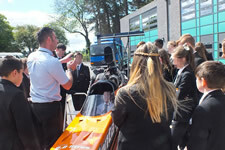 These visits are an impressive way of engaging young people in motorsport whilst drag racing can be incorporated into the National Curriculum through Transport, Science (forces and friction), Art & Design and Literacy. 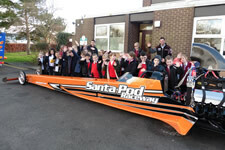 Santa Pod Raceway can provide event literature and art & craft templates so pupils can continue learning after our visit. These visits usually take place during January/February and late September/October when our season is quietest. Other dates may be possible depending on our other commitments - please email donna@santapod.com if you are interested in a visit from us. Visits are FREE! Please could you pass on our sincere thanks to David and Darren for an amazing visit – the children thoroughly enjoyed the session and it was lovely to see them asking so many questions! Thank you as well for all of the goodies – the school very much appreciate it. Looking forward to booking you again next year! Please can you convey a huge thank you to the guys for today's experience with the dragster. I have had such fabulous feedback, this evening from our staff. The guys engaged the pupils well and were very supportive to our pupils needs, and couldn't do enough for them so a big thank you. Our pupils were so excited and enthusiastic; we are expecting some wonderful writing about the experience. Thank you also for the wonderful gifts (goody bags for all the children) and two remote controlled cars - wow! I think today will be remembered for a long time. Just wanted to say a huge thank you for today! The guys were really great- the children listened to everything they said and were really inspired! They loved seeing the car and hearing about how it works. Thank you for the flyers, activity packs and car model too. A great day enjoyed by both staff and teachers, thanks to yourselves. Please pass on our thanks to the guys that came out to us today. Will be in touch for next year! 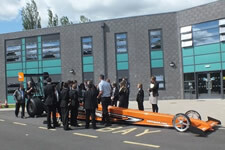 A very big thank you to you and team for arranging the Top Fuel Dragster to visit Windmill on the last day of term. It was an amazing experience! Below is a copy of the press release that our Academy PR team have sent out along with a photo. Please feel free to use all/some/none if you would like to! We have also run a mini-competition as a result of the visit asking children to tell us what they learned from the afternoon - I'll forward anything we get to you.